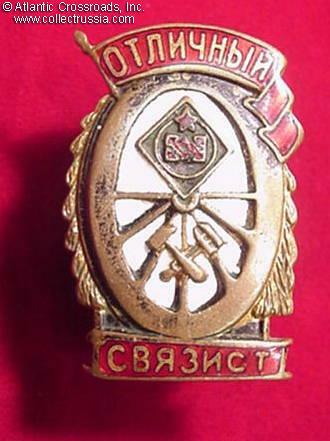 $750.00 Badge in Commemoration of the 5th Anniversary of the Stalin Railway Worker's Day, 1940. A very uncommon award for best railroad workers issued early during WW2, just before the German invasion of the Soviet Union. In outstanding condition and includes original maker marked screw plate. $1,495.00 Honored Railway Employee, Type 1, early miniature version in silver, #1730. Scarce, incredibly well made piece in very fine condition; includes original screw plate. $160.00 Honored Railway Employee badge, #110769, circa mid-1950s. Relatively uncommon, late post-war version of the highest Stalin era Soviet award for railroad workers. Features well-defined counter-relief. In very fine to excellent condition, a very attractive piece free of significant flaws. Comes with original MPS screw plate. $110.00 Honored Railway Employee badge, #149918, circa late 1970s-early 80s. A very attractive and well-made piece in near mint condition. $170.00 Shock Worker of Stalin Labor Campaign badge, Type 1, #10926, circa mid-1930s. Scarce three-piece version with extremely low serial number. Condition is very fine to excellent, extraordinary for a badge of such an early issue - this is one of the best examples we have handled in many years. Includes scarce original screw plate. $30.00 Narkomat of Railroad Transportation ID card. Issued in 1939 to a female laborer at Tomsk Railroad in Siberia. $120.00 Badge for Excellence in the Ministry of Transportation Machinery Construction, late 1940s through 1950s. Attractive and distinctive award in very fine condition. $55.00 Excellent Railroad Traffic Controller badge, circa early 1950s. Excellent condition. $110.00 Excellent Railway Car Maintenance Man, circa 1940s. One of the more scarce badges of the "WW2 railroad proficiency" series. An early version in excellent condition; includes original NKPS screw plate. $55.00 Excellent Railroad Builder badge, circa late-1940s - mid- 1950s. In fine to very fine condition. There are some tiny enamel chips that are not very detractive; the badge has very impressive overall appearance. $95.00 Excellent Railway Rebuilder Badge, circa mid-940s. An early version in outstanding condition. Comes with original WW2 type NKPS screw plate. $170.00 Excellent Railway Administrator badge, mid 1940s. One of the harder to find badges of the Soviet WW2 railroad proficiency series. In excellent condition and includes WW2 era NKPS screw plate. $25.00 Master in Assembling of Trains, circa 1980s. Near mint condition. $25.00 Badge for Excellence in Socialist Competition on the Railways, #113643, late 1950s - mid 60s. Outstanding, excellent condition. $75.00 Badge for Excellence in Socialist Competition on the Railways, #62415, circa late 1950s. Scarce Flat Back Version in excellent condition. $150.00 Excellence in Socialist Competition on the Railways, scarce screw back version, #50578, circa late 1950s - early 60s. In excellent condition. $45.00 Badge to a Builder of the Lenin Subway (in Leningrad), 1955. Well-made piece in excellent condition. $25.00 Leningrad Subway badge, 1955. Excellent condition.